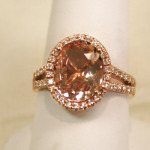 Morganite is really making a splash these days and we’re just tickled pink about it! A beryl mostly known for its soft, pink color, Morganite can also be found in peach, salmon and violet hues. While a sister stone of Emerald, Morganite typically forms without inclusions. Its translucent luster gives it a unique warmth and elegance. Many consider Morganite to be a “new” gemstone, but it has existed for millions of years, only earning the name Morganite, a nod to banker J.P. Morgan, in 1911. Gaining popularity over the past several years, this coveted stone makes a great statement piece as a cocktail ring, pendant, or earrings. It’s often seen set in a complimentary rose gold, often surrounded by diamonds or white topaz. 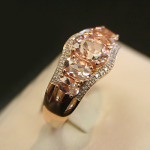 Stop in and see some of the gorgeous Morganite pieces we have in store today! 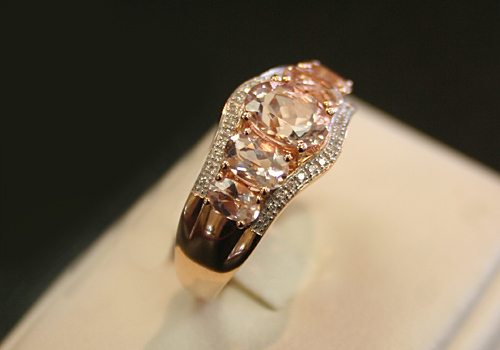 Morganite and diamond ring in yellow gold.